HIGHLAND GAMES DOG FASHION SHOW! Please note the time has changed – the Fashion Show begins at 1 p.m. on the front lawn of Aphrodite. 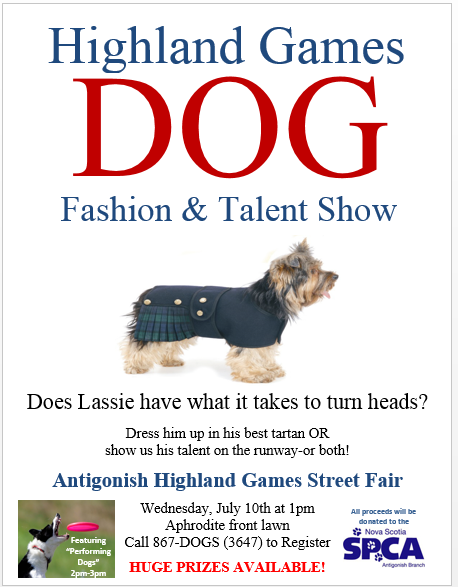 As part of the Highland Games Street Fair, on Wednesday, July 10, 2013, Aphrodite is hosting a Dog Fashion Show on their front lawn. Its back by popular demand after a hugely popular event held during the Christmas Street Fair last year. This summer the theme is consistent with the Highland Game – Tartan! Dogs will be judged on their costumes, behavior and/or talent. Katie Jamieson of Antigonish Happy Dogs is the organizer together with the Antigonish Branch SPCA and Aphrodite. This year we will turn the event into a fundraiser for the hardworking Antigonish Branch SPCA. Although the Antigonish Branch SPCA has over 40 members, the active core is much less in number. The Antigonish Branch SPCA covers a broad range expanding Antigonish Town & County, Guysborough County, Port Hastings, Port Hawkesbury and Point Tupper. They also help, on an as needed basis, Richmond, Inverness and Victoria Counties. The fashion show begins at 1:00 PM on the front lawn of Aphrodite. There will be a panel of Judges from the local area and Halifax and wonderful prizes of gift baskets from local merchants will be awarded for first, second and third places. Following the announcement of winners there will be a special Performing Dogs Show by Tara and Devin who are travelling from Halifax with their Disc Dog Agility Show. Be sure not to miss this event whether you enter with Fido or not!! ENTERY FEE: $5.00 per dog or $10.00 for multiple dog families. Register on site or in advance or at Happy Dogs Antigonish. PHOTOS: There will be a photographer on the grass to take pictures of Fido – this is generously being donated by The Antigonish .5₵ – $1.00. Photos are $10.00 each or $15.00 for multiple dog families. …And many more to come! !